Matty Jernigan (they/them or he/him) is a white and queer male-bodied person and dog dad to a goofy little corgi mix pup named Jolene. 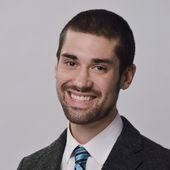 Matty drove from North Carolina five years ago after completing a Bachelor of Arts from the University of North Carolina at Greensboro in Media Studies with a concentration on media writing and literacy. They have been with Campus Compact since 2013, serving two terms of AmeriCorps VISTA as the Leadership and Development Specialist targeting student engagement with service in higher education and as the VISTA Leader. Matty is currently on staff as the Connect2Complete AmeriCorps program manager, focused on removing academic barriers for first-generation, low-income, and students of color in academic institutions through the practice of attendance initiatives, service-learning, restorative justice, and family engagements. They utilize and continue to work on themselves through an equity lens that centers historically marginalized voices and is rooted in the work of black and brown feminists, thinkers, colleagues, friends, and community members. Matty has led and co-facilitated trainings and conversations about intersectional queer history, non-violent communication and mediation, restorative justice, whiteness and white supremacy culture, utilizing and building an equity lens, and navigating a difficult service year. They are committed to the work of racial and social justice in themselves by navigating the struggles of white fragility, inevitable blind spots, micro and macro aggressive language and actions, and perpetuation of white supremacist attitudes and behaviors. In their free time, Matty inhabits and haunts queer nightlife scenes through a performative art practice and shares space and love with their chosen family here in Portland. They hope to be an asset in curating healing spaces and futures for all members and students that Campus Compact encounters.